If you ever wished that the CFC 2.0 could be made even smaller, then Boundless heard that silent prayer when it designed the CFC Lite. This tiny wrecking ball boasts a great retail value, and it packs a hell of a punch. For its ultra low price of $70, it can almost be guaranteed that users will not find a better dry herb vaporizer. It is the smallest Boundless vaporizer to date and it has arrived to show vape enthusiasts what it’s made of. Smaller than most dry herb vaporizers, the CFC Lite did not sacrifice size when it comes to its large capacity oven. Similar in design, the CFC Lite looks like a mini version of the original Boundless CFC 2.0; the unit is only about 4 in tall and 1.25 in diameter. The CFC lite isn't much bigger than a cigar torch lighter, which makes it extremely portable and easy to fit anywhere like in one's pocket, purse, handbag, backpack, etc. The device does not feature any digital display, as the CFC was designed to be pretty cut and dry. The unit features a button on the side that lights up various colors to signify selected temperature and if the device is powered on. At the back of the unit, there is an air intake hole that should never be covered since it could result in a clogged feeling when pulling from the device. The charging port is Micro USB and it's located on the opposite side of the power button. Just like the CFC 2.0, the mouthpiece covers the oven and it is easy to take on and off. The CFC lite features a full-size ceramic conduction oven that can fit up to a .5 of dry herb. This vaporizer is fairly basic in regards to its temperature control; it provides only 3 temperature settings (385°F/ 196°C, 403°F/ 206°C, and 421°F/ 216°C) which are indicated by the light on the face of the unit. The CFC Lite doesn’t disappoint in this area at all! 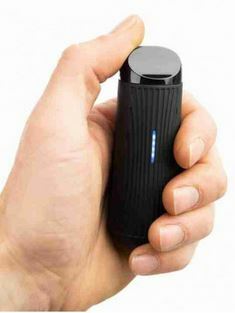 It may be the smallest conduction Dry Herb Vaporizer on the market, but it seamlessly competes with the big boys. Every session users can achieve thick, pure tasty clouds without a gross, hot mouthpiece. The CFC Lite has designed the airflow perfectly to the point that the vapor is never harsh on any of the temperature settings. The unit also gives consumers sweet rips of flavorful vapor every time they draw from the unit. The Boundless CFC Lite is really easy to use. To do so, simply press the power button located on the side of the unit 5 times- this will power the device on, as is the case with 90% of all vaporizers. Before powering it on, though, users should load between .3 and .5 grams of dry herb in the ceramic heating chamber. Once it’s powered on, the CFC lite takes about 30 to 40 seconds to heat up to the desired temperature. Once the device is heated up, it will vibrate alerting the users that it’s ready. As soon as it’s ready, draw slowly from the device and enjoy. Each session time lasts about 5 minutes before the auto shut-down. The CFC Lite features an 18350 battery which is rechargeable and replaceable. It seems lately that there is a new trend to include replaceable batteries for these devices so that users can have one charging while using the other one. This idea makes a good deal of sense. Boundless claims that users can get up to 6 sessions for every full battery. However, I would say that number is more like four or five in actuality. It is still convenient that users can swap out the battery at anytime with another one fully charged. When charging the device, it typically takes about an hour to charge and even though the batteries are replaceable, the CFC lite does not feature a "pass through charging feature" where the device can be utilized while it’s charging. The CFC Lite is a super steal with its low-price tag of $70 bucks! This baby beast boasts a convenient portable design, glorious vapor quality and full-sized conduction oven. Customers will not find another dry-herb vaporizer at this price point that can beat the CFC Lite. If the decision is made to purchase it, customers will definitely not be disappointed. Boundless knows no bounds when it comes to making exceptional products and the CFC lite is its newest triumph.